Real Madrid midfielder Luka Modric and Barcelona forward Lionel Messi. 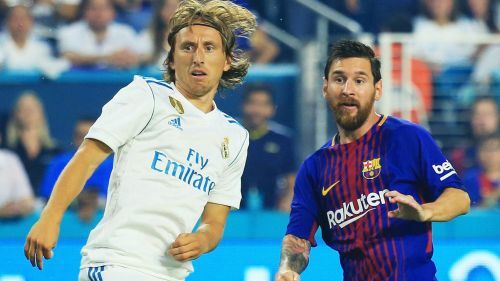 Luka Modric is a "spectacular" player but does not share Lionel Messi's class, according to Barcelona's Sergio Busquets. Debate over who is the premier talent in world football has been enlivened after Messi, 31, was left off FIFA's three-man shortlist for The Best award. Busquets will get another reminder of the 33-year-old's talents when Spain host Croatia in the Nations League on Friday, but his opinion as to the game's finest player is already settled. "The best in the world now and for many years is Messi, who is the greatest and will continue to be until he retires," Busquets told a news conference. "Modric is spectacular, but Messi has no comparison with Luka or anyone." Busquets' comments mirrored those of Luis Enrique, who is preparing for his home debut as Spain coach following the encouraging weekend win over England. Left-back Marcos Alonso was among the more impressive players at Wembley Stadium, making the most of his chance in Jordi Alba's absence. Alba was a surprise omission from Enrique's inaugural squad and Busquets is hoping his Barca team-mate does not remain in the wilderness. "As a team-mate, I miss him," he said. "He's a great player, but it's the coach's decision and we have to respect him. I'm sure Jordi is eager to return to the team and will work to make that happen."